Mumford & Sons are an English folk rock band. 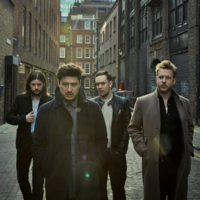 The band consists of Marcus Mumford (vocals, guitar, drums, mandolin), Ben Lovett (vocals, keyboards, accordion, drums), "Country" Winston Marshall (vocals, banjo, dobro), and Ted Dwane (vocals, string bass, drums). Although the band members have claims on certain instruments, the members switch instruments during live shows according to convenience, for they each play a variety of instruments. The band formed in late 2007, rising out of West London's folk scene with other artists such as Laura Marling, Johnny Flynn and Noah and the Whale.The band has often supported Laura Marling at concerts, while their association with Noah and the Whale can be traced back to St Paul's School, Barnes and King's College School, Wimbledon. Mumford and Lovett attended King's College School alongside Noah and the Whale bassist Matt Owens, while Marshall attended St Paul's School along with Charlie Fink, lead singer of Noah and the Whale.The band's debut album, Sigh No More, was released in the United Kingdom in October 2009, and February 2010 in the United States. On December 1, 2010 the band received two Grammy Award nominations, one for Best New Artist and the other for Best Rock Song ("Little Lion Man").